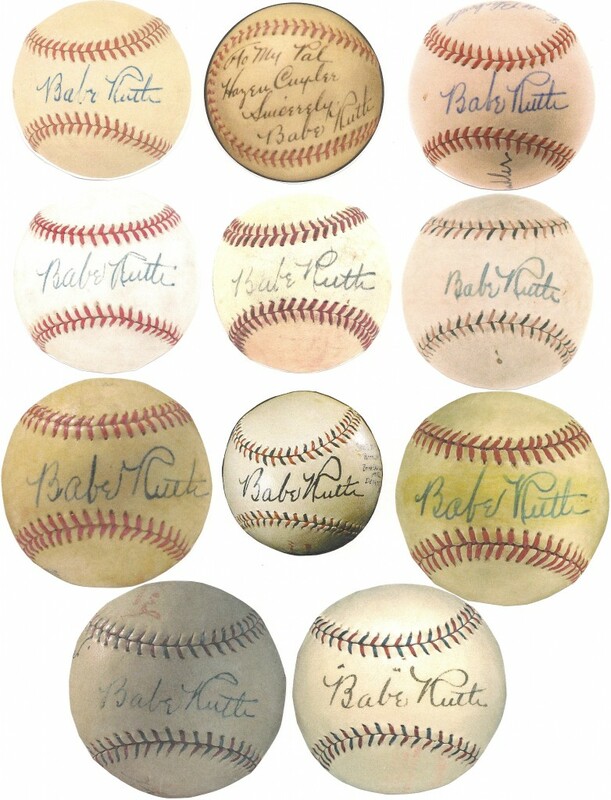 Operation Bambino, Part 4: How Many Genuine Babe Ruth Signed Balls Have Survived? How Many Were Ghost-Signed By Marshall Hunt And Others? This 1920 article written by Billy Evans evidences how prolific a signer the Bambino was even at the outset of his career as a Yankee. A collector walks into a sports memorabilia shop and says to the proprietor, “Hey, I have something rare to show you. It’s a 1920s-1930s baseball signed by Babe Ruth.” The owner of the shop replies, “Very nice, very nice indeed…but here, take a look at this. This is something far rarer… it’s a 1920-1930s baseball that’s NOT signed by Babe Ruth.” Bad joke or apocryphal story, that’s for you to decide. What is not in doubt or dispute is that there has never been any real shortage of autographed Babe Ruth baseballs moving through the hobby. 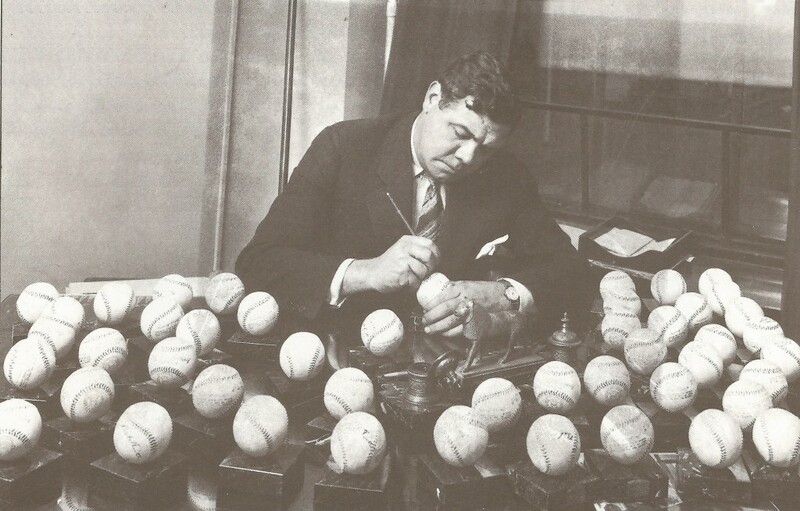 Babe Ruth signs several dozen baseballs in one sitting. It is interesting to note that he has not signed on the ball's "sweet spot." June 15th 1925; The Oakland Tribune: “Envied of All Youths RAYMOND EVANS and his most-prized possession, a baseball autographed by Babe” Ruth. Raymond and his pal, HENRY SODERLUND, Alameda school boys, were awarded the prized balls for excellence in school sports”. June 7th 1929; Jefferson City Post Tribune: Article recounts the story of 10 year old Billy Day, who while playing ball with friends, hit the ball across the alley into a neighbor’s yard. The neighbor, apparently tired of having to bother with the traffic and commotion of the boys playing, refused to give the ball back to Billy. Story was picked up by the wires and the Babe heard about it. End result was Ruth sent a dozen autographed baseballs to young Billy and his pals. 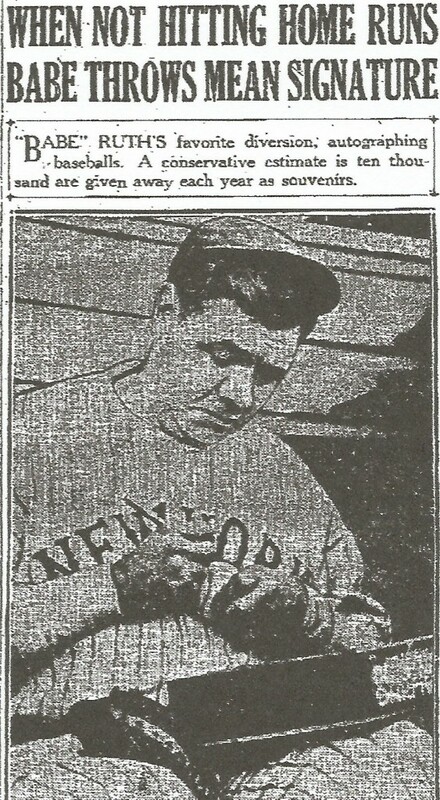 March 6th 1930; The Daily Herald; Biloxi and Gulfport Mississippi Coast: Article titled “Ruth Offers Help.” “Babe Ruth offered 1,000 autographed baseballs to sell or auction to aid in the rebuilding of Father Flanagan’s Boys’ Home, a Catholic orphanage, of which was partially destroyed by fire Sunday with an attendant loss of approximately $75.000. Ruth, who rose from the playground of a similar home in Baltimore to the head of baseball’s swatters, wired the offer of assistance from St. Petersburg, Fla”. June 19th 1931; Alton Evening Telegraph: As part of the coverage of the Browns-Yankees series in St. Louis “During the series with the Yankees the management of the Browns will give away 400 baseballs autographed by Babe Ruth. One hundred baseballs will be handed out to the fans each day the Yanks play in St. Louis”. May 5th 1933; The Galveston Daily News: Story out of Detroit, Michigan bearing the headline “Ruth Sends Balls to Orphan Heroes.” “In a Passaic. N. Y. orphanage live six boys who soon will add to their possession the priceless one of a league baseball autographed by Babe Ruth. The six baseballs were dispatched by the Bambino from Detroit today after the Yankees’ victory over the Tigers, when he heard the story of how the six boys flagged an express train yesterday near a track washout and prevented a wreck”. January 8th 1934; The Daily Mail-Hagerstown, MD: Advertisement for the new Babe Ruth Boys Club sponsored by Esso. Lists the following items to be given away to the boys as 2600 autographed baseballs, 1300 Babe Ruth fielder’s gloves, and 50 vacation trips to Babe Ruth’s summer baseball camp. June 27th 1934; The Evening Independent-Massillon, Ohio: Brief news blurb detailing Ruth’s pending appearance at an awards dinner for “newsies.” Ruth will be hand to present autographed baseballs to all the boys who were finalists in the circulation competition. August 6th 1934; The El Paso Herald-Post: “Babe Ruth autographed 10,000 baseballs, but it is hard to tell the difference between his autograph and that of Mr. Marshall Hunt, who often sat up with him all night helping him to sign bushels of balls for distribution to the souvenir hunters”. June 4th 1935; The Paris News (Paris, TX): Baseballs autographed by Babe Ruth will be auctioned off after the Talihina Indians game with the proceeds going to benefit the local CCC Camp. April 22nd 1937; Carthage Panola Watchman (Carthage, TX): Advertisement for the Babe Ruth radio show sponsored by Sinclair Oil. 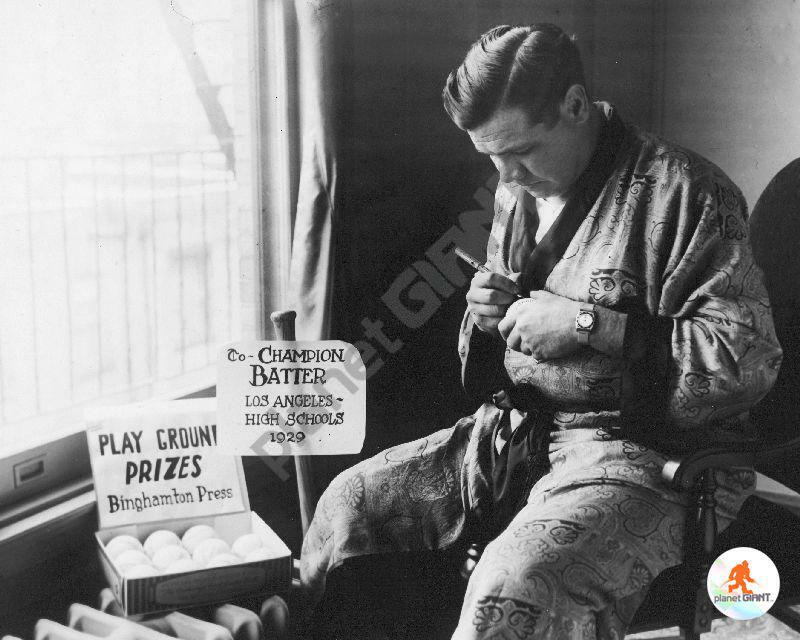 “Sinclair Refining Company, sponsors of the “Babe” Ruth microphone talks, also offers fans 522 prizes each week for the bust answers to a series of questions about baseball. Major prizes each week are two deluxe 1937 model Nash Ambassador Eight sedans and 20 RCA Victor Auto Radios. In addition, 500 Spalding Official National League baseballs “Babe Ruth autographed” will go to winners each week. Entry blanks in this Babe Ruth contest are being distributed without charge by Sinclair dealers in this community”. June 19th 1939; The Hammond Times (Hammond, IN): Announcement is made that baseballs signed by Babe Ruth will be procured to give to fans as part of an old timer’s game. July 11th 1940; The Ogden Standard Examiner: Coverage of baseball exhibition put on by Babe Ruth for area youth. Headline reads “One Time Batting Ace of Yankees Puts His Name To More Than 400 Baseballs, Cards and Programs At State Baseball Joust”. May 5th 1947; Dunkirk Evening Observer (Dunkirk, NY): Story of Ruth entertaining 13 year old orphan Danny May in his Riverside Drive apartment. 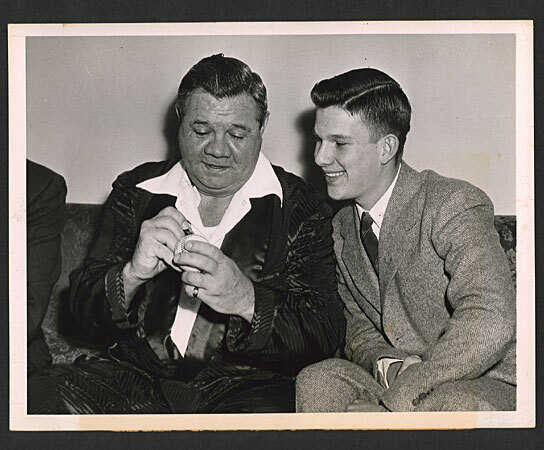 Danny May had won an essay contest of 100 words in length titled “Why I would like to meet Babe Ruth.” Ruth spoke at length with Danny, posed for pictures with him and autographed two balls for him. Ruth autographs a ball in-person for a fan who visited his apartment on Riverside Dr. in 1945. What impressed me most about what I found was not so much the potentially massive number, but the nature of these the accounts when viewed within a larger and more comprehensive personal context. We find Ruth autographed balls sent to help out or reward orphans in short order or on an impulse; some are tied to promotional purposes; and others may have been ghost signed by a man named Marshall Hunt (Sports Writer for the New York Daily News). What I think we see is that all of these sets of circumstances were consistent with the various facets of Ruth’s life; empathy for young children, a desire for monetary compensation, and the use of surrogates (similar to those who ghost wrote for the Babe). Interesting life parallels on a grand scale, but I guess that’s just how I see Ruth. 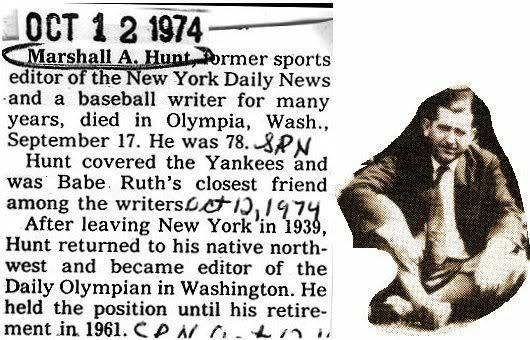 Marshall Hunt's Sporting News obituary noted he covered the Yankees and was Ruth's "closest friend among the writers." Getting back to thinking about the number of Ruth balls on the market, let’s consider what we could be dealing with if the total number signed was 100,000 and the survival rate was an anemic 20%. Mind you I consider both of these numbers to be extremely low (loved the Sandlot, but doubt that it happened with any great frequency), this would still leave us with 20,000 signed Ruth Baseballs. Why do I consider a top # of 100,000 and a surviving rate of 20,000 to be low? Let’s begin with the top number as seen within the context of span of time. For the sake of argument, let’s consider a 30 year span from 1916-1945. By 1916 Ruth was well established on the National stage, and by 1945 he would have just completed providing his public support in the form of appearances at War Bond drives and rallies. All in all, prime signing years as far as I’m concerned. Over this 30 year span, Ruth would have only needed to have averaged signing just over 3,300 balls a year to hit that 100,000 mark. Consider the figure thrown out by Colliers Magazine in 1930 of 50,000 baseballs. If the actual number was only half of that (25,000), Ruth would have reached the 100,000 mark be stringing together only four years like this during our 30 year span. My point being, even for allowing for inflated numbers and exaggeration, I just don’t see 100,000 baseballs over a 30 period as being anything but a conservative number. As far as what the survival rate might be, here too I have tried to work with a very conservative number of 20%. To hit that 20% number, it means that 4 out 5 of the recipients or families/descendants did not know enough or care enough about the ball to have saved it or passed it along. In my mind, these are various factors that I think make the 20% survival rate a very low estimate. 1. The nature of the Ruth signature itself makes it very easy to recognize. By this I mean in just looking at it, it is very easy to read and identify the signature as being “Babe Ruth.” 2. Since we would have very little trouble looking at the ball and being able to say this was signed by someone named “Babe Ruth”, here is where the value of name recognition comes into play. With the exception of Scotty Smalls, I just have hard time believing that this name would not resonate with 4 out 5 people who saw it. All of that being considered, lets further assume that of that surviving 20%, half of those were ghost signed. This still would leave some 10,000 Ruth signed baseballs on the market. What does a 10,000 number mean? It means that 200 collectors in each of our 50 States could have a Babe Ruth baseball in their collections. Mind you, to this point, we have not even introduced any number of balls into this population that are outright forgeries. I will leave that estimate to others who follow this market and item far more closely than I do. In the end, is an unsigned 1920-1930s Ruth baseball rarer than a signed one? Of course it’s not. At the same time collectors of such items need to have some idea of the market factors, that to date, have not been qualified or quantified by industry experts or professionals in any real degree of specificity, or at least substantiated in a reasoned manner with respect to quantity. Might this be because the standards of expectation and work in this area are the same as they have been for uniforms for decades; that being “it’s good because I said so” and it “came from an impeccable source.” I think we all deserve better, but that’s just me. The "Babe's Ghost" of "Ghost-Signed"? As always, collect what you enjoy and enjoy what you collect. But in my mind, the more you actually and objectively know about the items in your collection, the better off we all are. All 0f the above balls are disgusting and a total disrepect to the Mighty Babe. Thank you for such great articles. It makes since that there would be so many out there ,but we are talking about the Babe. To have an autograph ball would be a Holy Grail for most collector’s. It’s such a shame that there is so many deviate and unscrupulous people just for the money that’s so sad for the industry & sports fan! Forgeries are out there and now proof of ghost signings. How could the big authenticators overlook thistype of information? Thanks Mr. Grob for uncovering this important information. I was around at a time when you knew you were handling the Babe’s genuine balls (unsigned of course). The forgers are too good. I don’t see how anyone could attempt to authenticate a baseball signed by Babe Ruth without some unbelievable provenance. Thats what i dont get about autograph authenticators, how can you authenticate a signature without provinance base on just the autograph, knowing the forgers are flawless.